House on Fox Lake | Williamson Williamson Inc. Through the use of natural materials and the reinterpretation of the traditional Hanok typology, the House on Fox Lake evokes the client’s cultural history while contributing to the evolution of Canada’s regional modern architectural language. Hanok is a traditional Korean house type hundreds of years old. Typically located with a mountain in back, facing the water, and north in direction, each Hanok is built according to regional environments such as distance and direction of wind, water, land, and mountains. The raw materials used in Hanok construction, such as soil, timber, and rock, are all natural and recyclable. 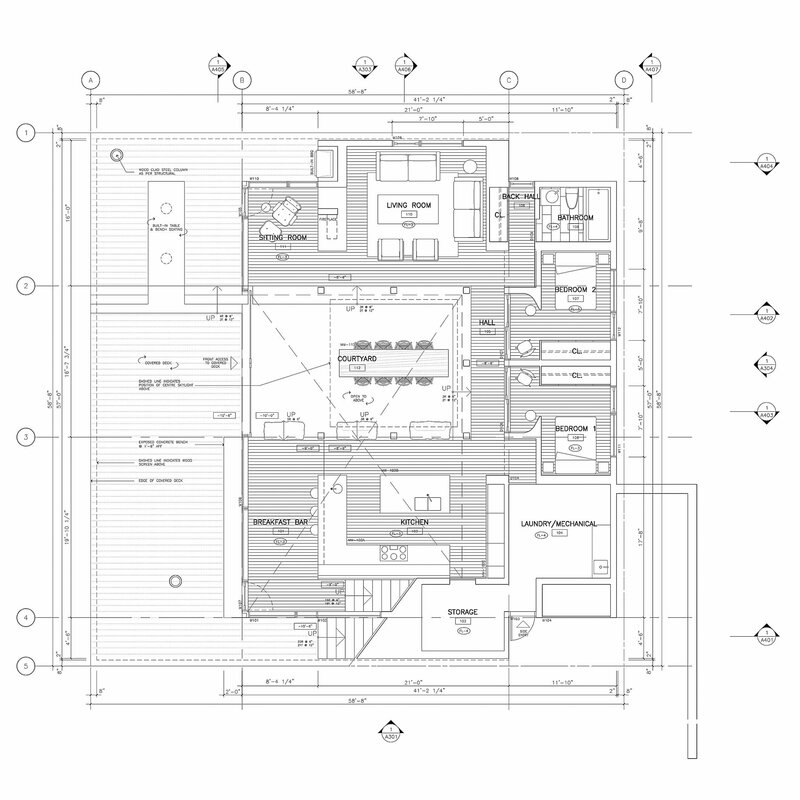 The formal planning and structural elements are also environmentally sound. Hanok’s have an evolved post and beam framework which sits on a stylobate at the bottom, stereotomic stone-block construction, and their own specific type of curved tiled roofs, Giwa, the edges of which can be adjusted to control the amount of sunlight that enters the house. A unique feature of traditional houses was their special design for cooling the interior in summer and heating it in winter. Since Korea has hot summers and cold winters, the Ondol, underfloor heating using the direct heat transfer from wood smoke to thick masonry or stone, and Daecheong, a cool, shaded wooden-floor style hall were devised to help Koreans survive the frigid winters and to block sunlight during summer. These primitive types of heating and air-conditioning were so effective that they are still in use in many homes today. These elements are the raw materials of the House on Fox Lake. Fox Lake is one of Muskoka’s many small lakes. The lands around Fox Lake saw their first development as homesteads, but the hills around Fox Lake were not particularly suited to farming and by the early 1900’s, many of the homesteads were abandoned. Timber became the primary interest in the area, with the Buck-Fox-Vernon corridor being a transportation route for logs for mills and bark for the tanning industry. Slowly, through the 1930’s, 40’s and 50’s, Fox Lake became a cottage lake, with a number of small summer cottages developing on the east and west sides of the lake. 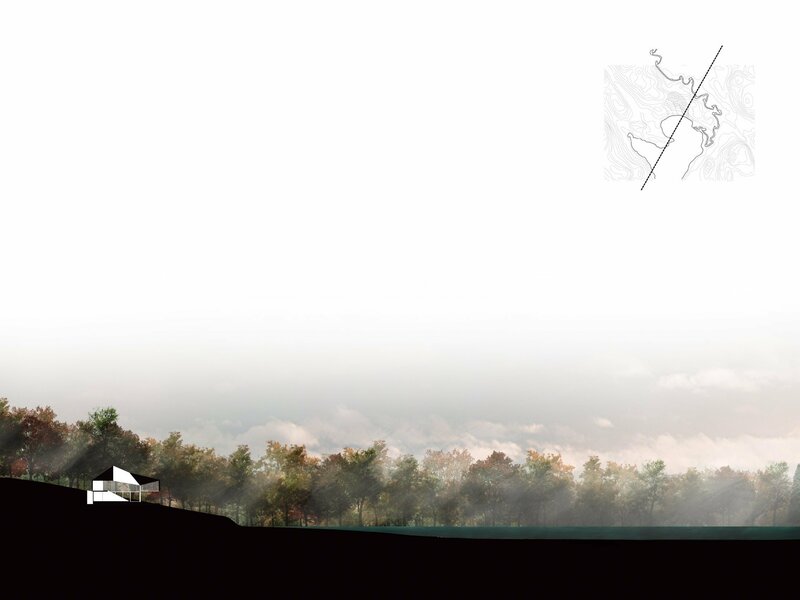 The ideal site for this modern Hanok is on a ridge formed by granite outcroppings that will make a natural ledge to approach from above, and then descend down one story to the lake side drop-off. 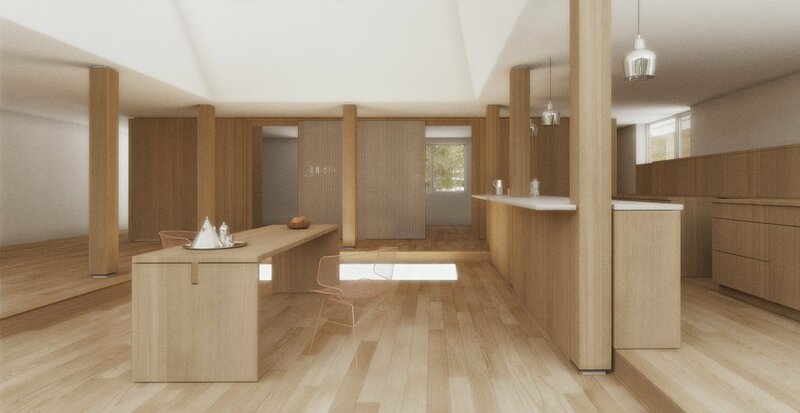 It creates a modest upper level approach and a nestled-in lower level and re-creates the Hanok section of open upper levels rooted by a stone base. 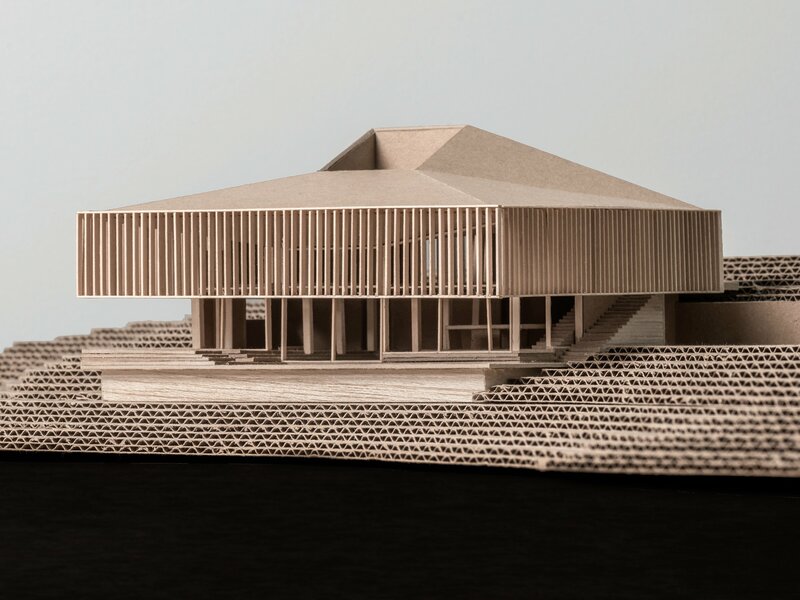 Even at this scale, the model shows the importance of the development of the roof line and the way that the central room will be light-filled and catch the lake-side breezes and views. 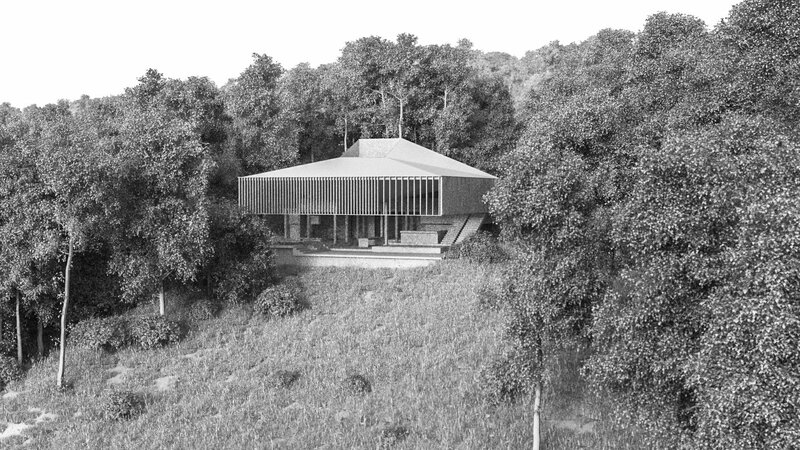 The massing concept for the house is a stacked double courtyard, in which an upper level wood clad ‘light court’ is nested atop a lower level living room open to the lake, yet enclosed by the hovering wood screen above. The upper level approach is toward a one story volume, which then drops into a lower level space which has a widened vista to the lake below. The roof is based on the Hanok’s sloping roof which traditionally sloped to the interior for drainage to an internal courtyard. 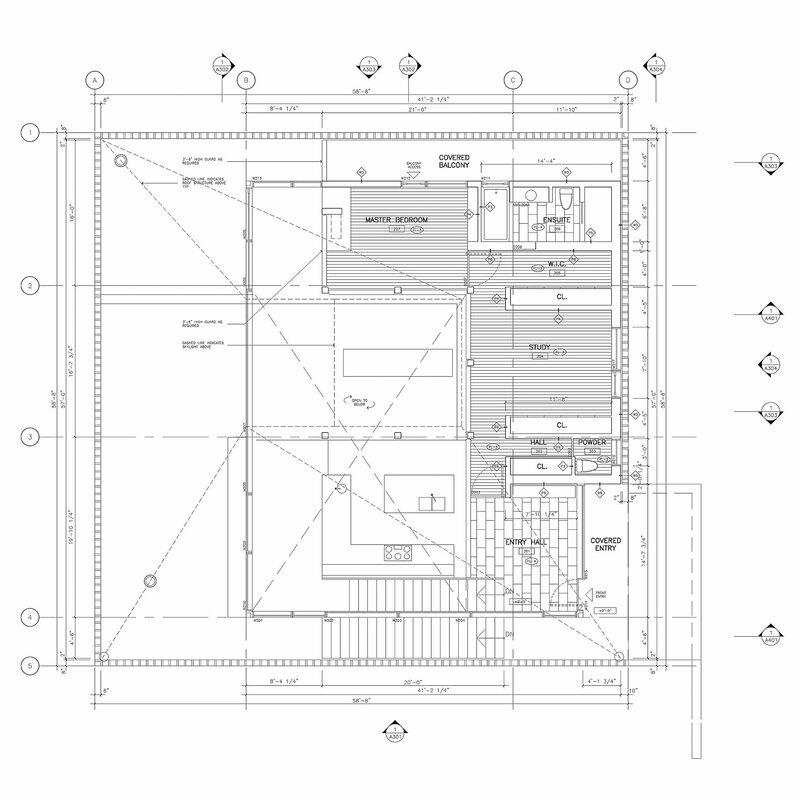 The realities of heavy snow and site drainage forced the reconsideration and inside-out flipping of the roof volume in this contemporary iteration. The roof of the Hanok was highly figural, formed a deep eave for shade, and was materially quite varied depending on the class of the owner – with materials raging from clay tile to wood shingles. 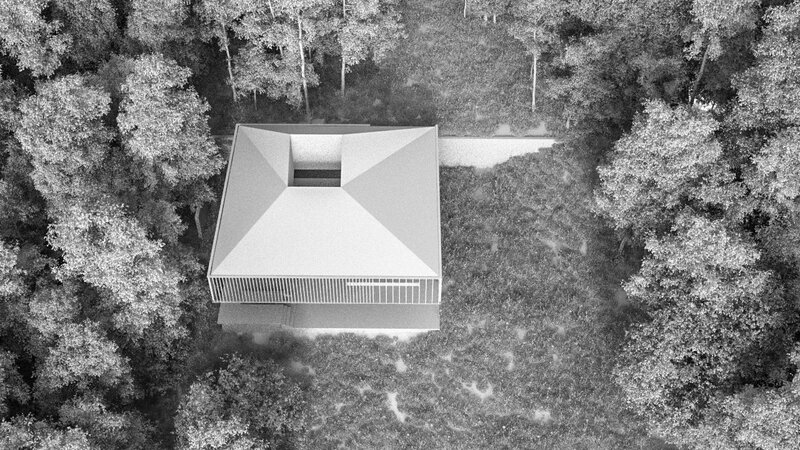 The development of the roof form in this house focused on capturing daylight at optimum angles and controlling runoff while developing a prismatic aperture for the skylight and buildable angles for the prefabricated roof trusses.